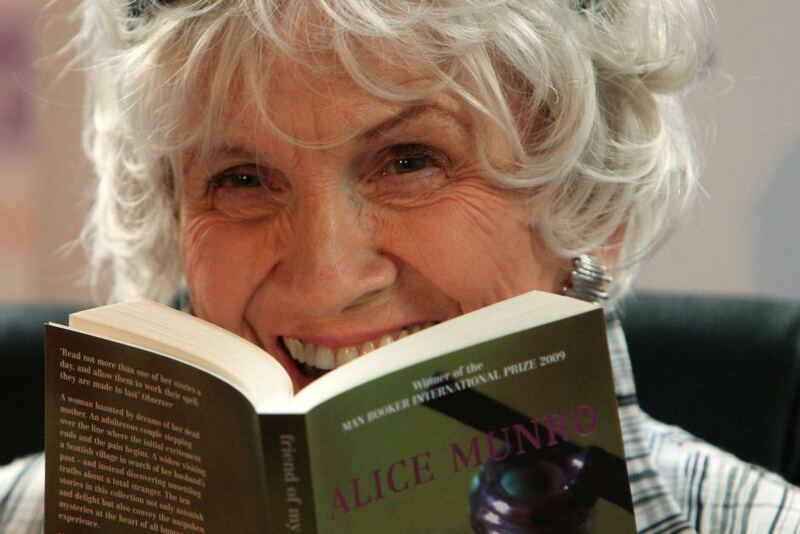 Alice Munro didn’t just win the Nobel Prize for literature this year, she also won the more elusive crown of being one of the few writers to win without controversy and possibly the only female winner to do so. That she won is no surprise in Canada where her books regularly grace the best seller lists, but outside of her home country, she is better known than read, and so the regular comparison to Chekhov sits behind the same disingenuous filter through which all accolades are viewed – who is not compared with Chekhov or Kafka in these heady days of internet-inspired superficial praise? Everyday we are encouraged to read a writer, be they new or established, and everyday we add to the list of writers we intend to read, a list whose extension exceeds retention of our grasp on what it means to be a reader, so when Alice Munro is added to our fat lists because she won the Nobel Prize, even if her sales go up, it doesn’t always mean she is being read. In an attempt to circumvent this inevitability, I decided to read one of her short stories, parting with only my $2.50 initially, before I made the plunge, or rather dropped her into my pool of great writers waiting patiently to be read. 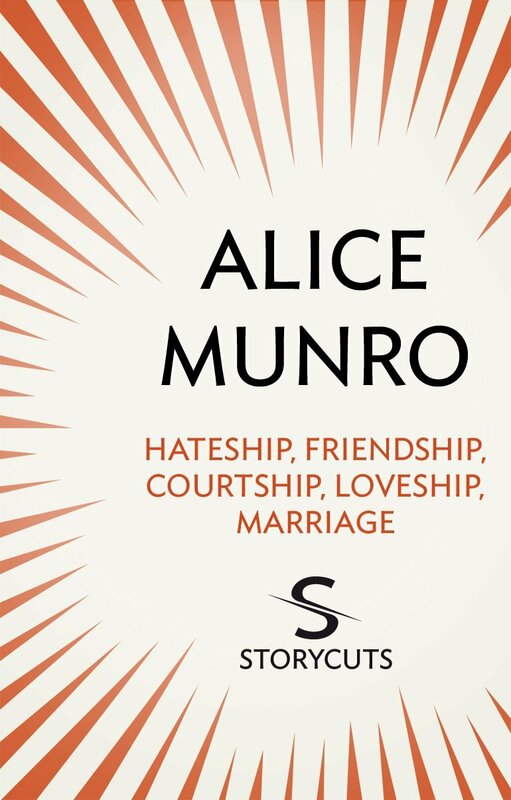 I chose the long-short story, Hateship, Friendship, Courtship, Loveship Marriage as my launch pad into the world of Alice Munro, and found myself unable to put the story down, despite the old-fashioned nature of the language and style, or at least what appeared to be such initially. The story is so modest, so restrained and so empty of authorial ego that it first occurs as disarmingly light and frivolous in your ability to gather meaning from the initial glance. Re-reading an Alice Munro sentence extends from pleasure not necessity, as meaning transmutes its way in, leaving your mind free for interpretation and creative inspiration. More than any other writer I have read, I found images of her stories forming inside my mind as if Alice and Lisa were building her stories effigy together. Even as I write now, I can see Johanna on that deserted train station, surrounded by carefully crated furniture, the distant Alice Munro’s directorial hand guiding my view. Alice Munro knows there is nothing new to say, and where the inexperienced writer searches for the unfamiliar, she scrupulously pillages the same basic narrative. Munro’s story is of the small rural town girl embedded in the Ontario landscape, who takes flight, marries young, has children, participates in the downfall of her marriage, returns, find nothing has changed, and reacts. There are variations on this theme, Hateship, Friendship, Courtship, Loveship, Marriage being a case in point, but the basic plot rarely strays from this premise, though rather than stultify the writers abilities, it reveals and affirms them. This seam has been keeping her mine alive for decades, the more she removes from the earth around it, the more she finds. 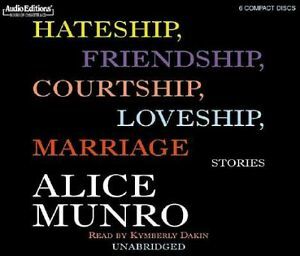 Yet, in her later years, to which this short story belongs, she adds suspense to her authoritative command, so there is no telling what is going to happen in Hateship, Friendship, Courtship, Loveship, Marriage despite its following Munro’s well-worn paths. You will find no spoilers in this review (every piece of me wants you to read this story) but what becomes of Johanna, what becomes of the too-clever-for-her-town Edith and what becomes of the born-to-be-bad Sabitha as the disparate family work to change her direction from that of her mothers, is not to be expected and quite frankly, gripping. “The complexity of things — the things within things — just seems to be endless, ” Munro told an interviewer. “I mean nothing is easy, Nothing is simple.” I am very lucky that my sweet brother gave me Dear Life for Christmas, as I have an entire book of Alice Munro stories sitting at my elbow right now, the pages pulsing with an expectation I know for sure the words will exceed. Now how often do you have that experience from the pile of books these days?